Millions of LAX passengers will now be able to reach their connecting flights more quickly and conveniently, thanks to a brand-new, $148-million facility at the airport. The Terminal 4 Connector is a new piece of the LAX Central Terminal Area that connects the airport’s south side terminals — Terminals 4, 5, 6, 7, and 8 — with the Tom Bradley International Terminal. 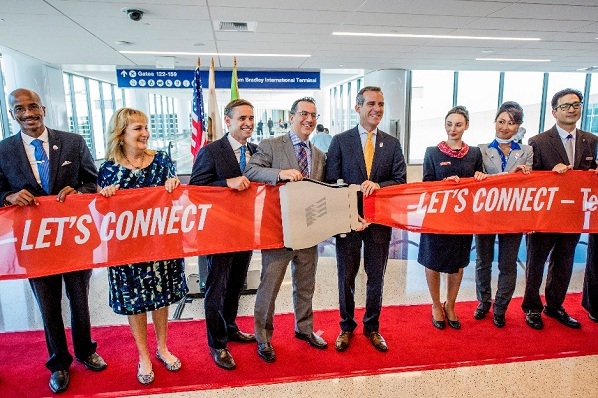 Mayor Eric Garcetti joined council member Bob Blumenfield and Los Angeles World Airports officials to announce the opening of the facility earlier today. The Terminal 4 Connector saves valuable time by giving travellers a direct, post-security route between terminals. Previously, passengers needed to exit one terminal and re-enter another through federal security screening to catch their connecting flights. “LAX is one of the driving forces of our economy, supporting more than 600,000 jobs — that’s why we’re investing $14 billion right now to make it one of the world’s premier airports,” said Garcetti. The new facility enables domestic passengers arriving at the south side terminals to catch international connecting flights at TBIT without going back through TSA security. It gives international passengers arriving at TBIT - who, by law, must rescreen their bags once they have cleared customs - an expedited security screening area that connects directly with the south side terminal concourses. TBIT and the south side terminals hosted a combined 52.3 million passengers last year — about 70 per cent of all the passengers who passed through LAX. The opening of the Terminal 4 connector is a significant milestone in the effort to create post-security connections between all LAX terminals. Future plans include another connector between TBIT and Terminal 3, and walkways between Terminals 1, 2 and 3. The Terminal 4 Connector is part of a broader $14-billion LAX modernisation that includes an airport rail system, a new rental car facility and capital renovations to eight out of the airport’s nine terminals. In total, the modernisation programme is creating more than 120,000 local jobs, and adding more than $20 billion to the economy.